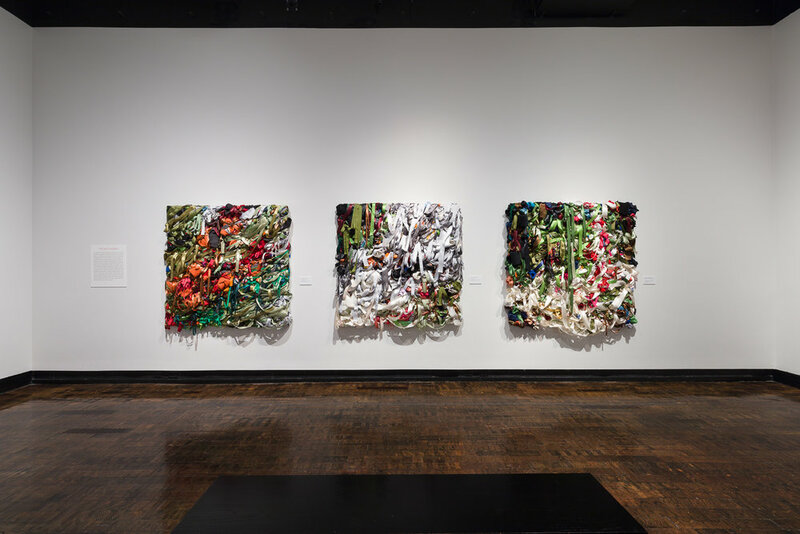 Vadis Turner transforms feminist materials into abstract paintings and sculptures. Connecting generations of women, her work re-contextualizes domestic textiles and other gendered goods. Turner’s production methods question traditional gender roles and assert value on female experiences. Each work fuses archetypal female figures with storied forms and landscapes. Content is drawn from literature, personal experience and community outreach from specific populations of women. Embodying multiple identities, Turner’s works often occupy places between textile and painting, and the wall and floor. Vadis Turner (American, 1977) received a BFA and MFA from Boston University and has exhibited her work internationally in galleries and museums. Her first solo museum exhibition was at the Frist Art Museum in 2017. Turner was awarded the Joan Mitchell Painters and Sculptors Grant in 2016. Her work is in the permanent collections of the Brooklyn Museum of Art, 21C Hotel & Museum, Hunter Museum of American Art, Tennessee State Museum, Kentucky Arts and Crafts Museum and the Egon Schiele Art Centrum. Selected group exhibitions include the Brooklyn Museum, Brooklyn, NY; Institute of Contemporary Art, Portland, ME; Andy Warhol Museum, Pittsburgh, PA; Islip Art Museum, Islip, NY; Minnesota Museum of American Art, St. Paul, MN and Cheekwood Museum, Nashville, TN. Selected press features include The New York Times, Wallpaper Magazine, Burnaway, Elle Magazine, Vanityfair.com, Observer, Artnet.com and White Hot Magazine. She is represented by Geary Contemporary in NYC and Zeitgeist Gallery in Nashville, TN.